Bayu provides a contemporary setting for those that like to indulge in a luxurious lifestyle. A sensitive balance between stunning architecture and flowing internal spaces creates a relaxed lifestyle. Bayu is surrounded by exotic vegetation and captures panoramic views of beach, mountains, sky and sea. Located high on Murphy Street, this luxurious home is designed over three levels. Enter the upper level with the ultra chic interiors of the lounge, dining room and kitchen. Gaze over the balcony to the views of Port Douglas and beyond. A timber staircase leads you down to two beautifully appointed bedrooms and two bathrooms. Access the sparkling blue swimming pool and sun pavilion from this level. From here a tropical garden pathway will lead yo to the two external guest quarters. 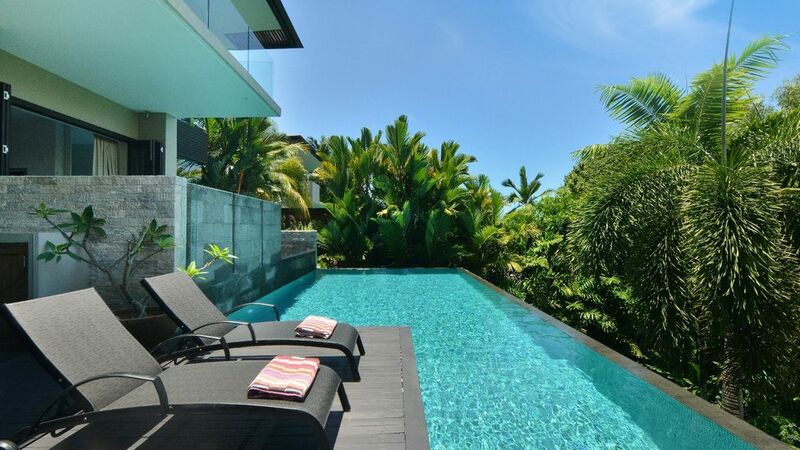 This is paradise with all the conveniences of Port Douglas just moments away. There is a sense of luxury in the attention to structure and finish that is both subtle and stunning. The architecture achieves tranquillity with the use of discrete contrasts in natural textures. Admire the limestone slab flooring against ebony hardwood or the thick frameless glass offset by hammered marble. All enveloped in a series of engaging ponds, pools and water features. Bayu has four bedrooms, including a king-size master suite. The second bedroom has the option of a king bed or twin singles. The remaining two bedrooms are in luxurious guest quarters, each with a king bed, nestled within the tropical gardens. With state of the art appliances and conveniences, this house offers a seamless combination of natural beauty and luxury. The option is available to holiday let the main house only. The main building has two bedrooms, one with king bed and the second with either twin singles or king. The nightly rate for a maximum of 4 guests would be $1100 during peak times.